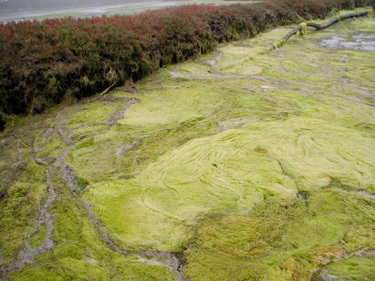 Algal mats in Elkhorn Slough are symptomatic of "fertilization" of the estuary with excessive nutrients. Photo by Kerstin Wasson. 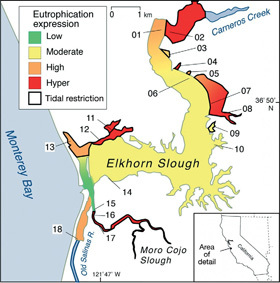 On this map of Elkhorn Slough estuary showing the 18 study sites, colors represent eutrophication scores. Sites with artificially restricted tidal exchange are outlined in black. All hyper-eutrophic sites have artificial tidal restriction. Credit: Hughes et al., Marine Ecology Progress Series, 2011. Excessive nutrient levels in Elkhorn Slough cause algal blooms and degrade the habitat for fish and wildlife in many parts of the slough. In the first thorough assessment of the effects of high nutrient levels on the ecosystems of Elkhorn Slough, researchers have mapped out the extent of the problem and identified ways to improve conditions at many sites. The study shows that virtually every portion of the estuary is affected by over-enrichment, with consequences ranging from thick algal mats floating on the surface to low night-time oxygen levels and reduced biodiversity. 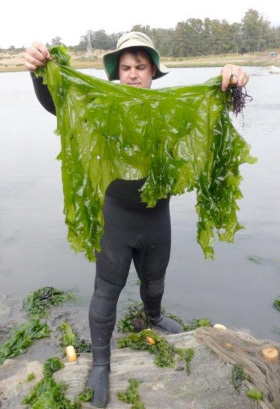 Published in the current issue of the journal Marine Ecology Progress Series, the study was conducted by a team of researchers from the University of California, Santa Cruz, and the Elkhorn Slough National Estuarine Research Reserve. "We've given the estuary a report card, and a lot of sites do not get passing grades," said coauthor Kerstin Wasson, research coordinator for the reserve and an adjunct associate professor of ecology and evolutionary biology at UC Santa Cruz. According to Brent Hughes, first author of the study and a graduate student at UC Santa Cruz, the main source of the excess nutrients is probably fertilizer in runoff from agricultural fields. Water with high nutrient loads enters the slough not only from the Elkhorn Slough watershed, but also from the lower Salinas Valley and Tembladero watersheds, which drain into Moss Landing Harbor at the mouth of the slough through the old Salinas River channel. "Water from the old Salinas River channel enters the harbor, and the tides pump that water all the way up the entire slough," Hughes said. The parts of the slough that show the most extreme symptoms of over-enrichment are upstream of water control structures that restrict the movement of water as the tides rise and fall. These sites have low biodiversity, lacking the large fish and abundant shorebirds found in nearby sites with more tidal exchange. While the ultimate solution to the effects of excess nutrients on the estuary is to reduce nutrient inputs, wetland managers can enhance local water quality by increasing tidal exchange to sites with tide gates or other water control structures, Wasson said. The excess nutrients stimulate the growth of algae, adding to the amount of organic matter in the system. Called eutrophication, this can lead to low oxygen levels and even "dead zones" as the organic matter decomposes. Hughes and his coauthors developed a eutrophication index to characterize the extent of the problem at 18 sites in the slough, using data from water quality monitoring programs and other measurements. The index scores are represented on a map of the slough in colors ranging from green, for low eutrophication, to red, for extreme symptoms of nutrient enrichment. The variation between sites in physical factors and in symptoms of eutrophication allowed Hughes to conduct statistical tests to identify which factors best predicted the site-level eutrophication scores. The factor that showed the strongest relationship with severity of eutrophication symptoms was tidal exchange. Tidal exchange is strongest near the mouth of the estuary, the only portion of the estuary to get a low score and appear green on the map. Proceeding up the main channel of the estuary, the rate at which water is exchanged with Monterey Bay decreases and the eutrophication score transitions from yellow to orange at the upper end. "Blooms of algae occur throughout the whole slough, but the parts near the mouth are deeper and more affected by tidal flushing, so the water doesn't become stagnant and you don't see the same consequences that you see where there is less tidal exchange," Hughes said. Tidal exchange is artificially restricted at many sites in the estuary, with water control structures such as culverts or tide gates placed in levees, which were built many years ago to protect human land uses from flooding. About a third of the tidelands in the estuary have such restricted tidal exchange, where there is less mixing with fresh ocean water than in areas near the mouth of the slough. Algal mats in these areas are retained rather than swept away by currents, leading to an accumulation of organic matter that fuels microbial growth and leads to heavy consumption of oxygen at night, resulting in low-oxygen conditions that can harm fish and other animals. The researchers found that all sites with the highest scores ("hyper-eutrophic"), were behind water control structures. "Low dissolved oxygen is really problematic because the fish need oxygen in the water," Hughes said. "Where the slough is hyper-eutrophic, we see fewer fish and invertebrates. It really cuts down on the diversity of the system." According to Wasson, local management of water control structures can improve conditions at individual sites for the benefit of the fish and birds that use these areas. "Opening tide gates just a bit wider at those sites that are currently colored red for highly eutrophic would convert them to orange or yellow--moderately eutrophic--and dramatically improve ecological conditions for fish and wildlife," she said. In addition to Wasson and Hughes, the coauthors of the paper include John Haskins and Elizabeth Watson at the Elkhorn Slough National Estuarine Research Reserve. This research was supported by the Elkhorn Slough Foundation, Central Coast Regional Water Quality Control Board, California Environmental Protection Agency, Monterey Community Foundation, and NOAA.